Thanks to the general public’s generous contributions to our crowdfunding campaign, the Aylesbury Leaseholder Group was able to submit its grounds of defence of the Aylesbury CPO decison last Wedsnesday. The grounds were prepared by barrister Chris Jacobs, of Landmark Chambers, who successfully represented the leaseholders in the final days of the CPO public inquiry. This is the latest round in the legal battle to maintain the goverment’s refusal to grant Southwark Council ownership of the leaseholder’s homes. Southwark has gone to the High Court for a judicial review of the decision, made by Sajid Javid, Secretary of State, Department of Communities and Local Government. Mr Javid has also submitted his grounds of defence and the Aylesbury leaseholders are heartened to see that he is sticking to his pledge to “defend the claim robustly”. The case will be heard at the Royal Courts of Justice on 9 May and the support for the leaseholders is growing. Aylesbury residents have just established a new Tenants and Residents Association, Wendover Community TRA, that is determined to protect their interests. Southwark Defend Council Housing organised a fundraising benefit for the TRA, with a special screening of ‘I, Daniel Blake’, followed by a discussion led by director Ken Loach. £600 was raised, with £100 donated to the leaseholder legal fund. A demonstration is set for the 25 March - Council housing, not luxury flats! - and will march from Canada Water, site of the biggest regeneration in Southwark, to the Aylesbury estate. There is a realistion across London that this is a decision that has ramifications for all leaseholders on all council estates facing regeneration. Over 180 separate donations have been made by individuals, union branches, TRAs and campaign groups, and the crowdfund stands at over £7000 - but more is needed to ensure that the leaseholders are represented on the 9 May by a barrister, so our new target is £10,000 - please give generously! 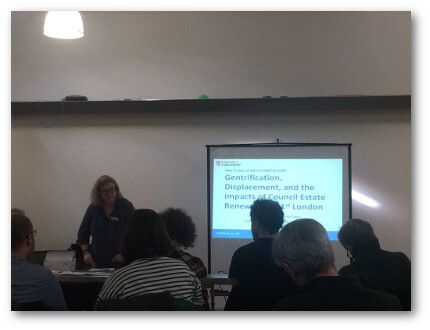 On 17 Feb we attended the launch of an exciting new research project investigating the impact of estate renewal, led by Professor Loretta Lees from the University of Leicester. The three-year project involves several partner organisations and aims to provide an evidence base to shape future policy agendas as well as a handbook for residents of council estates under threat of demolition. Residents from the Aylesbury estate were present at the launch as well as residents from estates in other boroughs such as Haringey, where their Council has just signed a controversial deal with Lendlease to redevelop several of its estates. Loretta’s research is key in challenging the ‘sink estate’ discourse and developer-led redevelopment model that Southwark has so wholeheartedly embraced. She gave compelling witness evidence at both the Heygate and Aylesbury CPO public inquiries. We very much look forward to being further involved in the project.